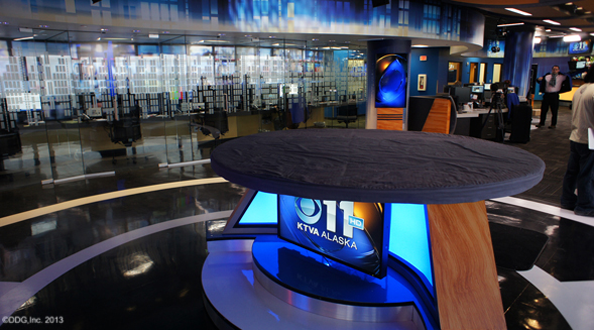 KTVA-TV, the CBS affiliate in Anchorage, Alaska, is preparing to debut its new set and newsroom from Devlin Design Group. Devlin tweeted the photo above as a preview of the set, which appears to be a large open newsroom area curved headers, sliding glass panels and multiple flat screens. A recurring theme of the new set seems to be vertical columns of rectangles — this graphical element appears in both the headers and on the glass panels.